The old order changeth, yielding place to new . . . . Pictured at the left is Lauren Life, who has resigned as Chairman of the Observer’s Board of Directors, effective December 31. Jay Presser, right, was voted to succeed her. Both plan to continue in other roles supporting the paper. Any organization is only as good as its leaders, and the Observer has been enormously fortunate to have had Lauren Life as the Chairman of its Board of Directors for the last five and a half years. Lauren has made the decision to step down from her post; she and her husband have “downsized” in a move to East Longmeadow, and the time seemed right for her to make an additional change. She will continue to work behind the scenes in the Observer office, so we won’t lose touch with her, which is a great blessing for the staff. 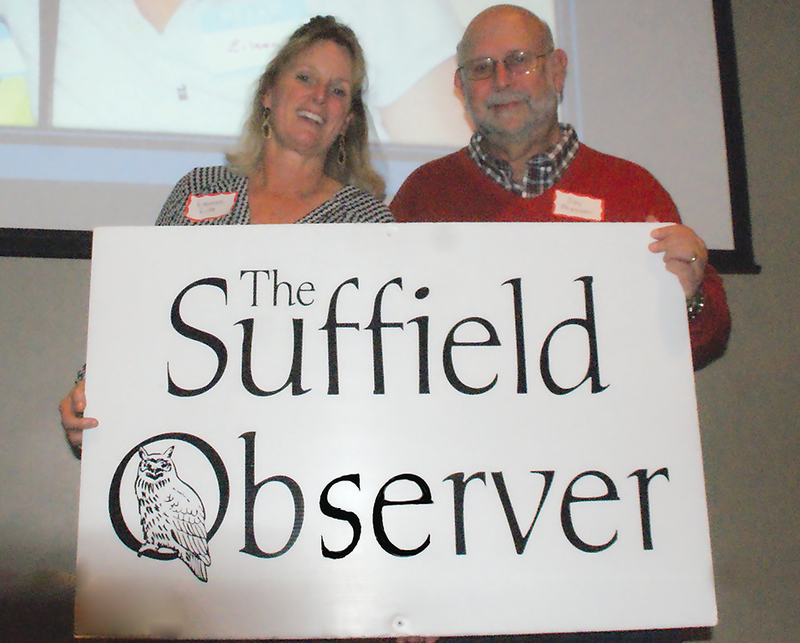 Before her recent move, Lauren had lived in Suffield for more than 30 years and had worked for much of that time in the Observer office. She has also served on other town committees, such as the library foundation and the community center group. At the time that she took on the Observer chairmanship, she was also principal of a small independent school in Longmeadow, with one daughter in college and the other in high school. It was a busy life, but Lauren runs on high energy and thrives on multiple tasks. During her tenure as chair, the paper added color, which brought it to the next professional level. Two Observer scholarships were inaugurated, in honor of Sam Fuller and Bob Warren. The paper also went on line with a dynamic web presence and grew significantly in size. Although she modestly attributes those accomplishments to the work of others, the fact is that her leadership enabled much progress at the paper. Lauren’s management style, to borrow a corporate term, accounts for much of her success. She is hard working and diligent, with a firm but markedly gracious manner which inspires loyalty and commitment from others. When asked what has given her pleasure from her years at the Observer, she named the relationships she has enjoyed and the camaraderie among the volunteers, many of whom have become personal friends. She was initially drawn to Suffield because of its small town feel, and an attraction of the Observer was the contributions she felt it made to the sense of community here. She points out that East Longmeadow is only a few minutes away, so she is not abandoning her post altogether! Clearly she has left a mark on the paper and the town, and for that we are all deeply grateful. Jay Presser, a retired attorney, has lived in Suffield nearly 40 years. Moving from Cincinnati to join a small law firm, he chose Suffield as his home because of its proximity to both Springfield and Hartford, making a doable commute for himself and for his wife Johanne. During those 40 years, he has been actively involved in many aspects the life of our town: school sports, the Rotary Club, the ambulance board, the zoning board of appeals, and most recently, an organization called Survivor Journeys, which supports cancer patients and their families. An energetic soul he is, and a man who is often tapped for leadership positions. When asked why he agreed to take on the position of Chairman of the Board of directors of this newspaper, Jay spoke with admiration of the volunteer staff who spend endless hours and considerable skill in the service of its publication. Although he himself has had little experience with publishing outside his work here at the Observer, in his professional life he specialized in employee/employer relations; he has had significant experience in helping others arrive at decisions, in managing people to form a compatible and productive team, and in negotiating among agendas to keep a focus on mission. Who could ask for more? Although Jay has had many conversations with his predecessor about the responsibilities of his new job, he will face challenges in the days ahead. Because the paper does not charge subscribers, its income is dependent on ads. Ninety-eight percent of the work is done by the more than 100 volunteers, whom Jay so admires, and many of them are retirees. The members of the younger generation tend to be preoccupied with family and career, and in the future good volunteers may become harder to find. Money is tight; the office operates on a shoestring. The recent move to digital publication has been a great success, but who knows what the future holds for a small town adventure like ours? Whatever lies ahead, we are all grateful that Jay will be our man in charge! Get Your Poinsettias at FFA’s Holiday Sale!